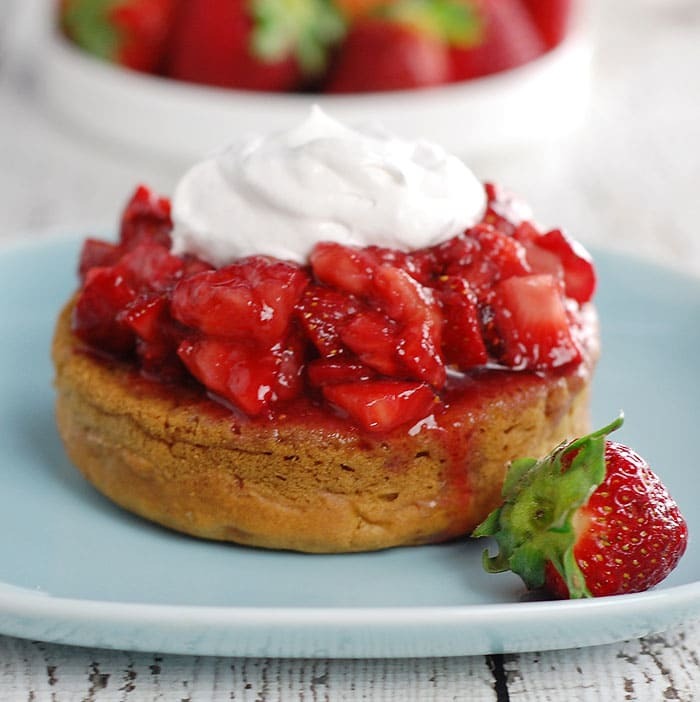 Home » Dessert » Vegan Strawberry Shortcake Recipe with Aquafaba! Vegan Strawberry Shortcake Recipe with Aquafaba! Vegan Strawberry Shortcake for Everyone! What’s not to love about a vegan strawberry shortcake? This recipe takes a little extra time because you’re making it from scratch but this recipe is worth it and uses aquafaba. Before you know it my vegan strawberry shortcake recipe will be your go-to all summer long. I love to tinker with recipes and it drives Cheryl crazy. It’s just my nature to change things up each time. That’s why I made an out of the box Lavender Gin Strawberry Shortcake instead of the plain one I grew up on. My Mom prepared her strawberries for shortcake like most people in the 70s. She would cut up the strawberries and sprinkle them with sugar, mix and let marinate in the refrigerator. Those strawberries then went into store-bought cake cups and topped with a large spoonful of Cool Whip. I have a much healthier version for you that’s tastier too! Since I wanted to make a strawberry shortcake that reminded me of my childhood – the little cake cups that were displayed in front of the fresh strawberries at the grocery store. The best part of those was that they were spongy and soaked up all the sweet strawberry juice. I had some Wilton Mini Tasty Fill 4 Piece Pans in the cupboard and they made the exact shape I was looking for. The trick is to just barely cover up the middle part so they don’t get too thick. Can I Make This with No Oil Added? I made one version with oil and another one with no oil, but I will admit to spraying the pans with olive oil for both to make sure they didn’t stick. But you can cook the batter in a muffin pan and use liners to keep them oil free. It takes no time to mash up the strawberry filling. It’s just chopped strawberries mashed with a little gin, balsamic vinegar and some NuNaturals Simple Syrup made with stevia. 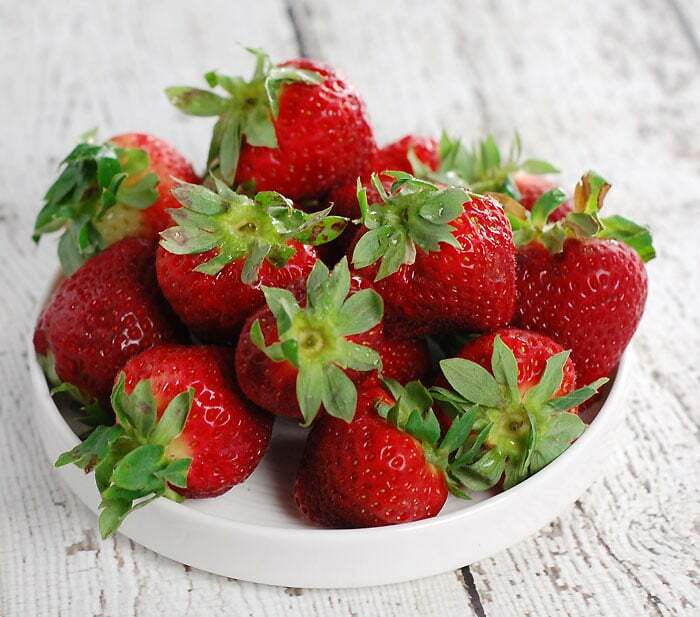 Depending on how sweet your strawberries are you may not need the simple syrup and you can use your choice of sweetener to taste if you don’t care for stevia. I love the botanical taste of gin and love to add it to desserts to give them a slightly herbaceous flavor. You can also leave it out if you don’t imbibe or make some strong lavender tea to use in its place. My favorite gin is Uncle Val’s Botanical Gin. It has an unusual combination of herbs that are amazing together: juniper, cucumber, lemon, sage, and lavender. The flavors are subtle, but the slight lavender flavor is what makes it my favorite. You can use plain gin if you can’t find Val’s. Do I have to By Lavender Balsamic Vinegar? I happened to have some lavender balsamic vinegar on hand, but you can use regular balsamic and add some lavender extract into the strawberry mixture. If you don’t like lavender just leave it out.This dessert is meant to make you happy, so feel free to change out ingredients. Everything is good with just a hint of lavender! Now you can make the cake cups of your childhood that are no oil added, no refinded sugar and vegan. I use something called aquafaba, or bean water. I used the liquid drained from a can of chickpeas, but you can also use the liquid from homemade beans. 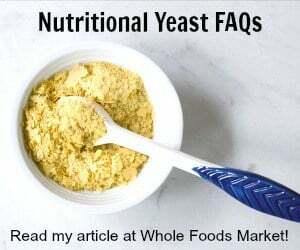 See more info on aquafaba on the official website. Preheat the oven to 350 degrees. 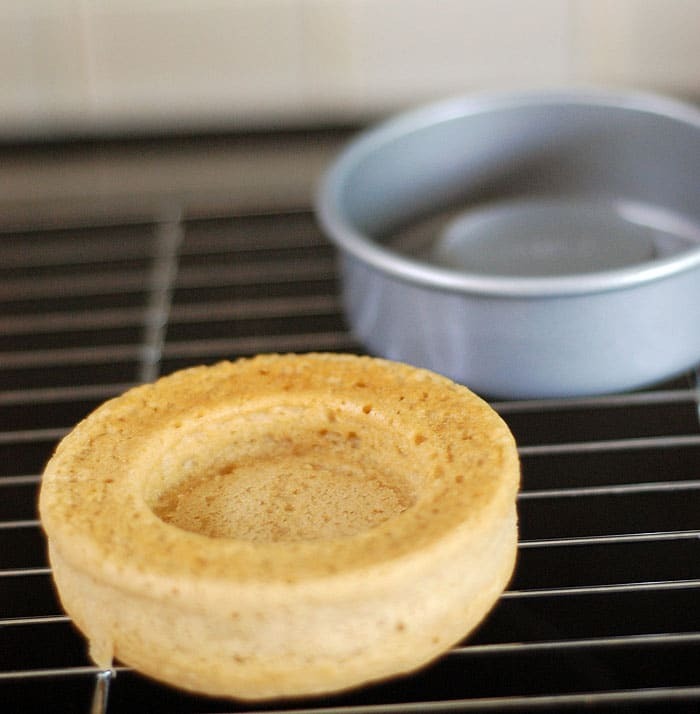 Grease 6 mini cake pans or line a muffin pan with cupcake papers. Mix the wet ingredients in a medium bowl and the dry in another. Add the dry to the wet and mix until thoroughly combined. Use a 1/4 cup scoop and add one scoop per muffin cup. If you are using the Wilton Mini Tasty Fill 4 Piece Pans use 1 1/2 scoops per pan. 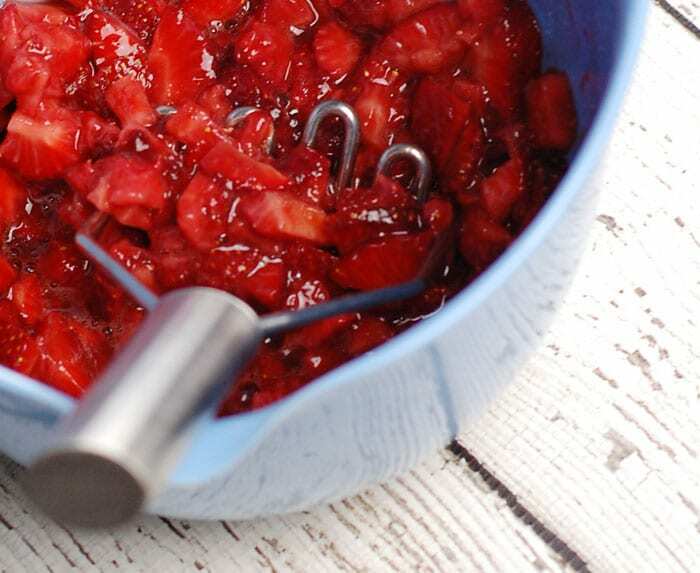 Put all the strawberry filling ingredients in a bowl and mash some with a potato masher. You just want to extract some of the juices, but most of the berries pieces will be whole. Generously ladle the strawberry mixture over the cake. If you are using muffins you can split them first. 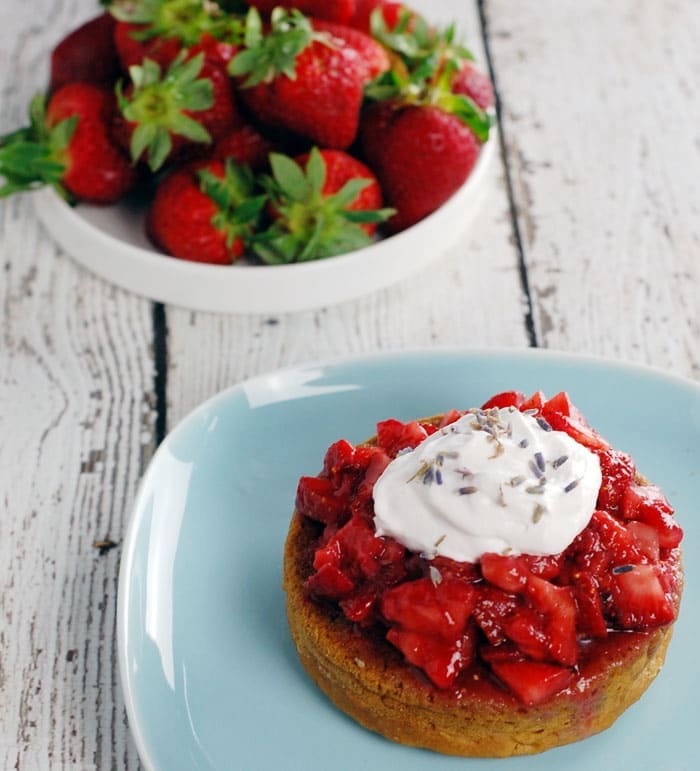 Top with vegan whipped cream, culinary lavender or even more strawberry mixture. Purely irresistible!! Love the tweeks you’ve made on a traditional treat… the lavender is brilliant! Thanks for this recipe. I love using herbs in recipes! Lavender is one of the many members of the mint family that are used as culinary herbs, such as: basil, rosemary, sage, marjoram, horehound, savory, and thyme. Wintergreen tastes like a mint but isn’t part of this family. Most are easy to grow in a garden or pot. I am starting to use nustevia slowly in my baking. I will definitely try your recipe with NuStevia. Love those pans. And this flavor combination sounds wonderful. I counted 5 different strawberry varieties at the Portland farmers market this morning. I definitely need to try this shortcake. Craving one of these shortcakes now! The lavender and strawberry combination is just so Springtime worthy and perfect.. and the addition of gin too is an extra decadent touch. Yum! I can’t wait to cook with aquafaba!! I love lavender this sounds dreamy!! I can’t wait to try it for the next cookout we have! I’m just getting started, but I like what I’m getting so far! Oh Kathy, these look so good. I had no idea bean liquid had a name!! I always save the ‘juice’ after I’ve cooked up a batch of beans, and now I’ve got another use for it. And I’m going to look for Nu=Natural’s Simple Syrup too. I’m totally fine with the taste of Stevia!! Kathy, this looks wonderful! Would you mind telling me where you got your Uncle Val’s gin? We live in the same area and I have not been able to find it in NC. Thanks so much! Hi Shelly! I got it at the ABC store that’s in that little shopping center behind the Chapel Hills Whole Foods. It where 3 cups used to be. So yummy! My inspiration for my website is to hopefully be as good as this one is! so many wonderful recipes!